One of the many gems along Italy and, not surprisingly, recognized by UNESCO as World Heritage Site: Siena shalldefinitely be on your to-do list. As it is suitable for a two-day break rich in history, art, good food and renowned wines, it is recommended to choose a central accommodation, such as the Hotel Palazzo Ravizza in Siena, to visit it comfortably on foot. 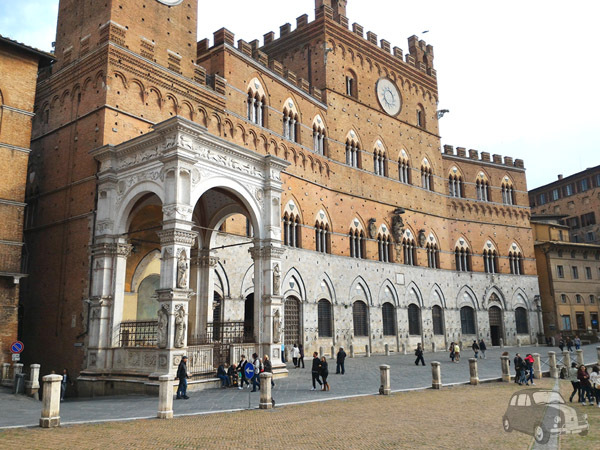 So let’s discover what to see on a 48-hour journey to Siena. The visit of Siena can only start from this unique square. Famous throughout the world to host every year Palio di Siena, Piazza del Campo is also recognised for its shell shape divided into 9 sections in honour of the Government of the Nine of the XIII century. The Palazzo Comunale, a building in Gothic style surmounted by the Torre del Mangia, the 4th highest tower in Italy with its 88 meters and whose top can be reached thanks to 400 steps, stands on this square and hosts the Civic Museum with stunning artworks and frescoes. At the highest point of the square, there is also the Fonte Gaia, a monumental fountain built in the 15th century to celebrate the flow of water for the first time in this place. Actually the one you see today is a copy made in 1869, whereas the original marble work is kept in the nearby Museum of Santa Maria della Scala. Thus, we arrive at the old Via Francigena, of which Siena has represented, for centuries, one of the main Tuscan stop-overs. Along this road, indeed, pilgrims and wayfarers, orphans and sick people could find shelter and assistance in the Hospital of Santa Maria della Scala. Today this structure is a must-see museum with a unique architecture, artworks related to the history of the city as well as of contemporary art, thematic exhibition itineraries and temporary expositions. The Municipality of Siena has been promoting for several years the initiative #Sienafrancigena an urban trekking route that is also available in a children’s version (#Sienafrancigenakids) with 3 different itineraries to discover. While walking through Siena and its wonders from Porta Camollia to Porta Romana, where the street takes the name via Banchi di Sopra, stop by the historic Pasticceria Nannini to taste the traditional cantucci. Over the centuries, pilgrims arriving in town had paid homage to the Duomo of Siena, a 13th-century construction in black and white marble (these are the colours of the city of Siena), with green and red marble decorations, both outside and inside. In your 48-hours itinerary among the streets of this city, the Duomo is an essential destination to discover all the treasures that are kept in it: works by Donatello, Michelangelo (in the Piccolomini Chapel), Pisano and Pinturicchio. Finally, the Baptistery of San Giovanni behind the Duomo. Built in the 14th century, in the same Gothic style and in white and black marble too, the Baptistery houses frescoes of famous Renaissance painters and bronze sculptures by Donatello. There is also a Baptismal Font made of six panels representing the life of Giovanni Battista realized by some of the greatest Italian Renaissance sculptors. A masterpiece not to be missed during your 48 hours in Siena.